Observation at junctions – for example, this could be not looking properly and failing to see a vehicle and then causing the other driver to take avoiding action when you pull out. remember that a closed junction will require more care than an open junction. Not using your mirrors when changing direction – an example of this would be when you know you need to change lanes but you don’t properly check your mirrors and end up cutting dangerously in front of another driver who is already in the other lane. It could also be when you pull up at the side of the road but forget to check for following traffic and pull up without a signal. Poor steering – a fairly self-explanatory one I guess but not steering correctly is usually due to your speed being too high and so you don’t have enough time to steer correctly and end up swinging out too wide or clipping the kerb. Turning right at junctions – when emerging it is important to look carefully and make sure you don’t pull out in front of a car already on the road, similarly not crossing dangerously in front of an oncoming car when turning from a major to minor road. Moving off safely – do make sure you do all your observations (including your right blind spot) before moving off. Poor road position in normal driving – make sure you are looking as far ahead as possible and down the centre of your lane. Don’t look for too long at the kerb or centre white line otherwise you will find yourself drifting in that direction – remember your hands follow your eyes! Poor control when moving off – most likely to be either stalling repeatedly or rolling back too far when performing a hill start. Try to make sure you don’t bring the clutch up too quickly and make sure it is definitely at the biting point for a hill start. Response to traffic lights – how often have you seen and ‘amber gambler’ or even someone blatantly drive through a red light? It is unlikely on a driving test that you would do that (well, hopefully not!) 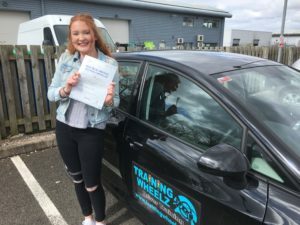 but with all the pressure and nerves associated with a driving test it could be easy to miss a red traffic light and not be slowing down – until the examiner points it out, by which time it may well be too late to avoid a serious driving fault. Poor/wrong response to traffic signs – one of the most common examples is not coming to a complete stop at a mandatory STOP sign. So, take care to avoid having any these be the reason for you to not pass your driving test – good luck!